Are You Going To Get The Boot This Christmas? You are here: Home / Chapter 7 Bankruptcy / Are You Going To Get The Boot This Christmas? This may be the season for giving. However, the city of Chicago is looking to do some taking. What I’m talking about is an expanded effort to attack those who have outstanding parking tickets. If you have three or more outstanding parking tickets, you are subject to the boot. If you are unable to pay the amount necessary to remove the boot, your vehicle will be towed and impounded and you will continue to incur storage fees. There is nothing worse than going out to your vehicle and noticing that you have a boot on it. So what do you do if you can’t pay it? Well, this has become such an epidemic in the city of Chicago that there are now advertisements specifically targeting those that have outstanding parking tickets owed to the city of Chicago. A clever Chicago bankruptcy law firm has decided to target a very small niche of the population that has outstanding parking tickets. The reason to target such a group is that the damages in terms of the boot, the tow, and the impoundment are so injurious to the vehicle owner that there has to be a remedy in place. For the many in need of that remedy, it comes in the form of a chapter 13 bankruptcy filing. Chapter 13 is a bankruptcy reorganization whereby the ind ividual pays whatever he or she has available per month to a chapter 13 trustee. The chapter 13 trustee then pays out pursuant to a plan to all of the individual’s creditors over a three to five-year period. The great benefit with chapter 13 in connection with parking tickets is that those debts can often be paid back at a very small fraction of what is owed. For example, if you are someone who owes $10,000 in parking tickets, your chapter 13 plan may very well propose to pay back $1000 over a three to five-year period. Also, while your chapter 13 case is pending, the city of Chicago must release your vehicle, may not re-boot your vehicle or tow your vehicle based upon those past due debts. As you can see, chapter 13 provides a tremendous benefit and a much smaller pay back with regard to parking tickets owed to the city of Chicago. For this reason, it is clear why a smart, Chicago bankruptcy law firm would advertise on the television toward this group of individuals. Now there are certain qualifications for chapter 13. The person must have disposable income from which to fund a chapter 13 plan. The person must also take a one hour credit counseling session, provide four years of federal tax returns and provide two months’ worth of paycheck stubs. However, these requirements are very manageable for someone who has just had their vehicle booted, towed and impounded. To see if you qualify for chapter 13 bankruptcy relief, contact my office at 847-520-8100. My experienced attorneys will sit down with you, face-to-face, at no cost and with no obligation to proceed. You will learn everything you need to know about chapter 13 as it relates to your particular fact pattern. If it looks like something that will help you, my attorneys will recommend the proper case and will advise you as to what steps you need to take next. 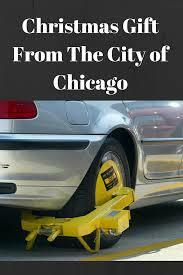 Don’t let the city of Chicago give you the boot this Christmas. Avail yourself of federal laws and chapter 13 bankruptcy to help you retain your property and pay back less to the city of Chicago over the next 3 to 5 years.